Pets come with things, too! In some homes, they have as many toys as a child might! Balls, feathers, ropes, bells... What to do with all those things? 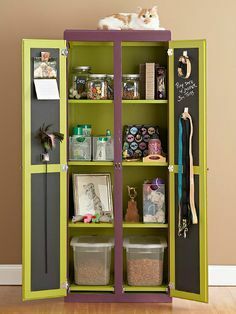 You can use a closet style storage space like this one to store food, toys, etc., if you have multiple pets or need additional storage. You'll have space for baskets of toys, bins of food and any other accessories your pet may have. 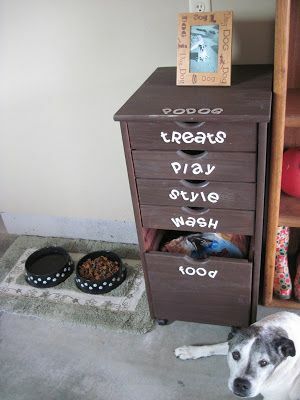 You can also use a little pet station like the one below to separate all pet related items such as: toys, food, treats, brushes, shampoos, etc. Most importantly, separate items in a way that makes sense for you. If you have more than one pet, separate by pet, perhaps. Otherwise, separate by type of item - food, medicines, cleaning, toys, leashes and collars. Use containers for how much you have. Don't buy bins for what you think you have; sift through it all first!